Comments: My wife Nancy said, “Hallelujah” would make a beautiful Tag. 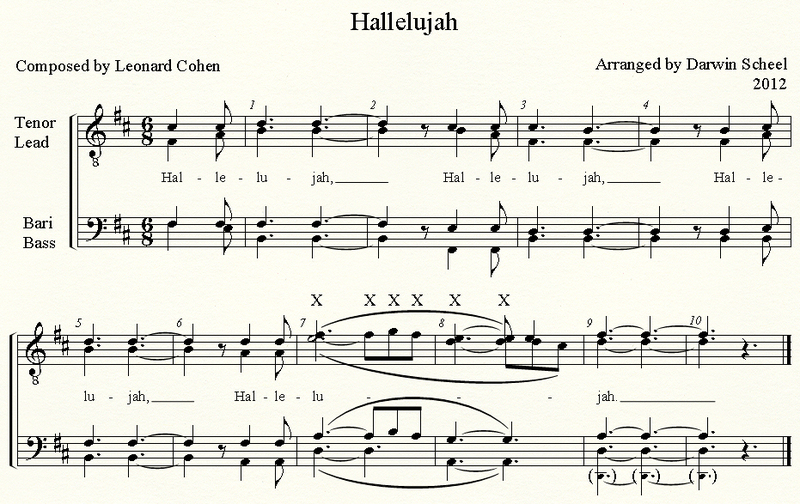 “Hallelujah” has familiar melody and lyrics, very simple parts, and is fun to sing. 3. Thoroughly learn the individual parts on your own and when teaching this Tag, start with the lead part first, the beautiful melody, until it is learned. Then teach the Bass part next with the Lead part softly singing along with the Bass part. After the Bass part has been learned, teach the Bari part with the Lead and Bass softly singing with the Bari part. Then teach the Tenor part with the Lead, Bass, and Bari softly singing along with the Tenor part. This teaching/learning process allows the parts to rehearse their part and remember it while other parts are being taught. 4. Know the sound of each individual chord in the Tag being taught; knowing when a chord is incorrect can be helpful in identifying appropriate part corrections. Learn the sound of each chord by playing the chords on a piano or listening MP3 recording of the Tag. 5. Let the singers know that this Tag “Hallelujah” has a "6/8 feel", which evokes the styles of both waltz and gospel music. Lock/tune the unisons, perfect 4ths, 5ths, octaves, and add expression to ring the chords and enjoy this beautiful Tag. 6. Start the Tag singing session with a shorter easy Tag before teaching “Hallelujah” or when inviting another singer to sing this Tag with unknown singing abilities. Result: Instant chords sung with a successful and fulfilling outcome for all singers and listeners.